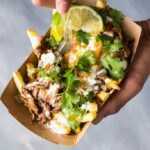 Slow Cooker Enchilada Chili Cheese Street Fries are a fun way to bring food truck style fair home! Makes great party food or a fun family dinner! Typing on this screen cannot even begin to convey the excitement I have for the all new series that I’m sharing with you this summer and it starts today!!! Food Truck Fridays!! 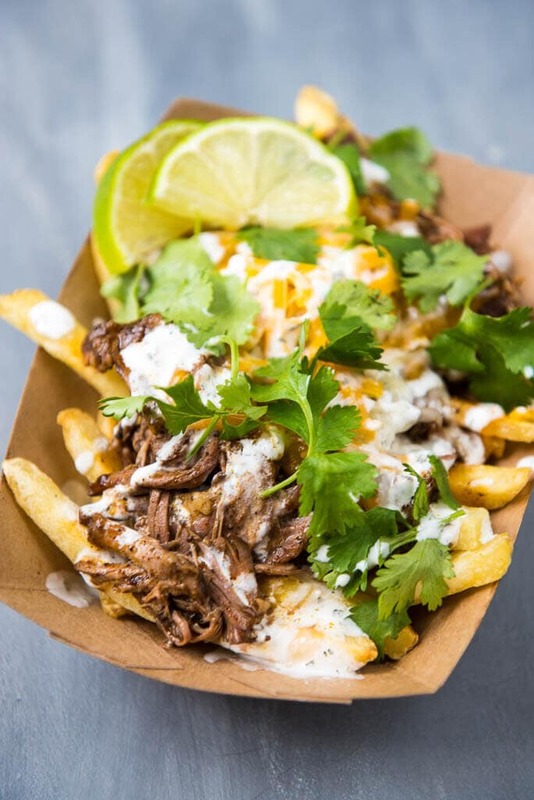 I have finally found a way to combine my love for all things slow cooking along with my obsession for food trucks to share with you recipes that I would make if my dream of owning my own food truck were a reality. Every Friday this summer I will share a new recipe with you that pushes the bounds of typical make at home fare and gives you exiting new eats to try with your family and friends even if you can’t make it to a food truck festival. Is anyone else as pumped about this as I am? When Shawn and I first got married and lived in our little college apartment with our little apartment stove I used to make chili cheese fries all the time. I thought it was pretty much culinary genius. Waffle fries, a can of chili and top it all off with shredded cheese and sour cream. And hey, that still works. But if you want to take it up a notch and enjoy a dinner that will temp you to keep on eating until you are in a food coma (in good way!) 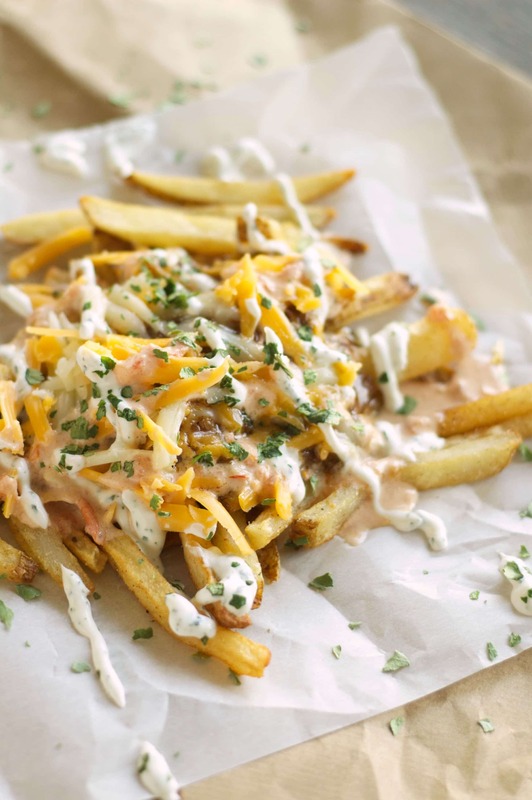 then give these fries a try! 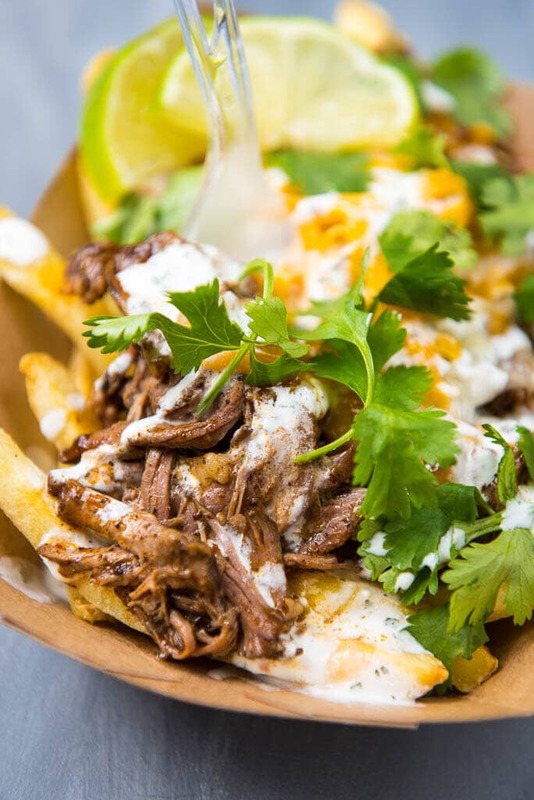 What are street fries exactly? 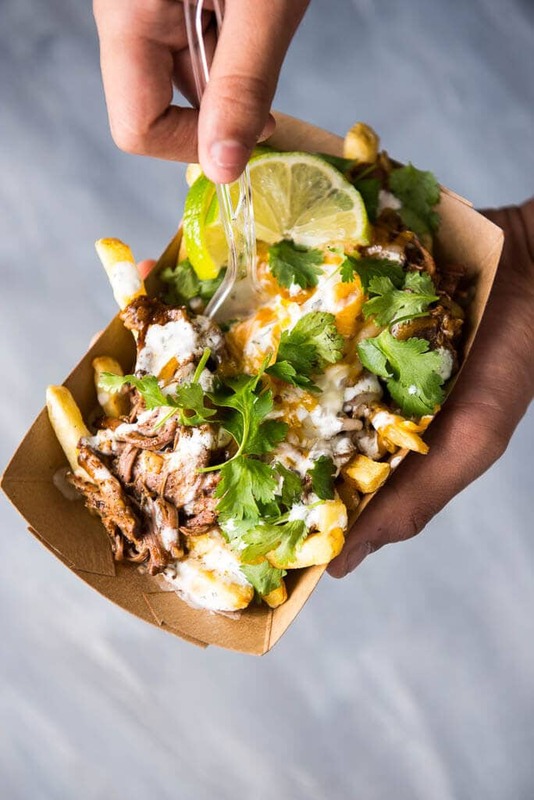 Well, I think it’s just the idea of pushing the boundaries of what you might eat atop a pile of French fries and have it taste amazing. And this is my version. Because I have an ridiculous obsession with the idea that I will one day own my own food truck. It’s ridiculous because the truth is I have no desire to put in the kind of hours and work involved with running the said food truck. But that never stops me from dreaming up all the recipes and dishes I would serve. No doubt about it these would be at the top of my list! Would it be weird to serve these along with sushi….? See, my mind just keeps wandering around all the different possibilities. Don’t worry, I have some much more reasonable ones coming your way in the weeks to come. I’m picturing my food truck lined up with about 50 slow cookers. Now that would be pretty cool! Well, in the meantime I guess I will just keep dreaming up the recipes and sharing them here with you…. if you all don’t mind! In two separate containers mix together the ingredients for the cilantro sour cream and for the salsa ranch. Cover and refrigerate until ready to serve. At meal time prepare fries in oven according to package directions. Other things I might serve on my food truck? 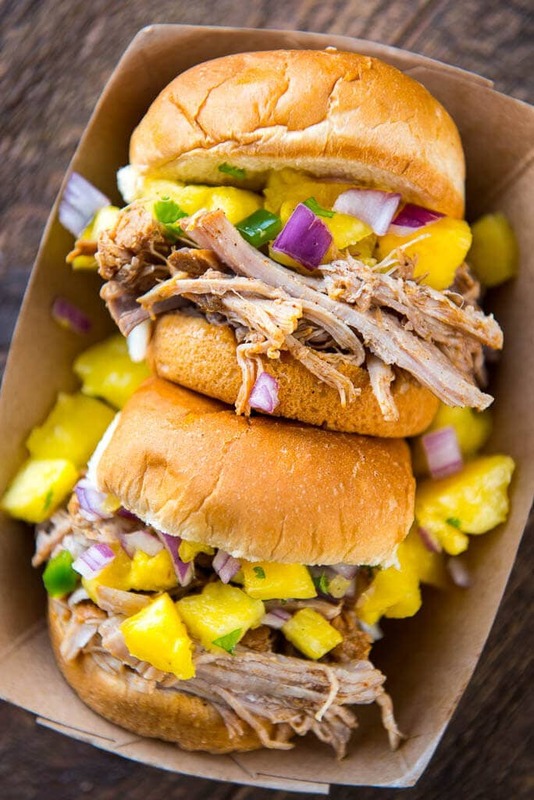 How about these Caribbean Jerk Pulled Pork Sandwiches? Make them in the slow cooker or the pressure cooker! 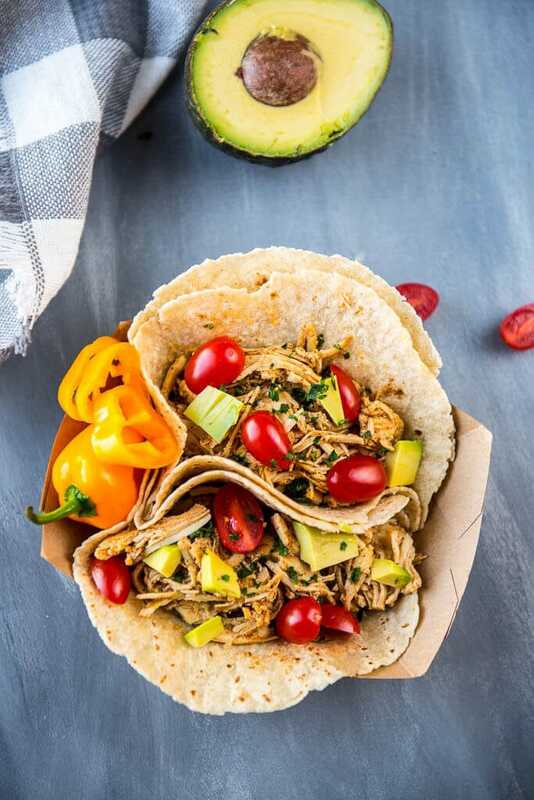 Or make it simple with these Verde Chicken Tacos! This recipe was originally post to my blog on June 20, 2014 and has been updated to include fresh photos and a slightly updated recipe that yields even better results. Plus, it was the prefect recipe to start out my Food Truck Friday series! I was disappointed that your recipe included so many missing details. Why not take the time to proof read before you hit that SEND button? 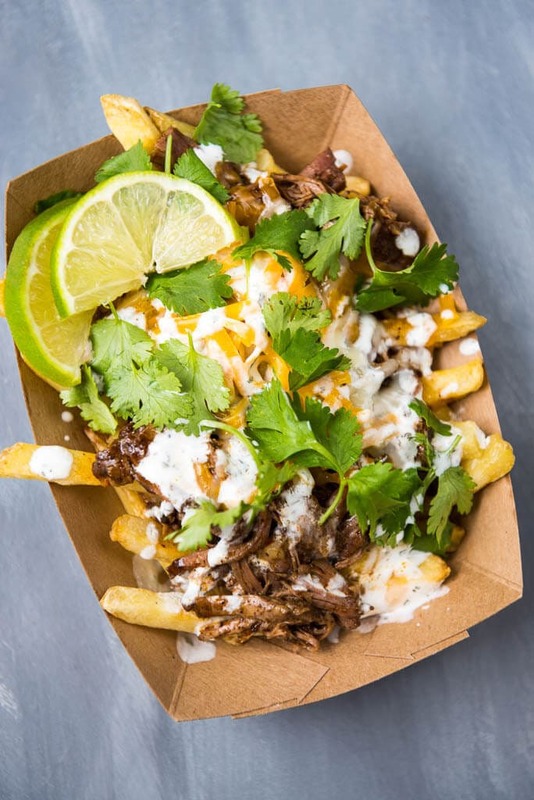 Here are a few of the details that I suggest that you include in your next version of this recipe: 1. specify the chili powder that you used (you specify that you used french fries by Trader Joe’s, so why not include the name of the chili powder that you used? ); 2. Specify the salsa that you used and the ranch dressing! Will not each ingredient significantly affect the taste? ; 3. Specify the paprika! (there are several types that are available on the Spice/Seasonings Aisle of most grocery stores these days, don’t you know? ); 4. And, how about the flour? Why just include the term flour? Would any old flour work? You did you not use just the term “salt”! You specified Kosher salt, as you should have, IMO! ; 5. Lastly, what about the cheese? Did you mean to suggest that we should use half shredded sharp cheddar and half shredded Monterey Jack cheeses? Is so, why not specify that? If your goal was to allow your followers to duplicate your recipe, then I suggest that you re-read your recipe and consider my criticisms. I prepared your recipe using McCormick brand Chili Powder, McCormick brand Smoked Paprika, Gold Medal all-purpose flour, fresh lime juice, Frank’s brand ranch dressing, Old El Paso brand medium, thick and chunky salsa, 1 cup of Kraft brand shredded yellow sharp cheddar cheese and 1 cup of Kraft brand shredded Monterey Jack cheese. Please join me and other home cooks who want to duplicate your recipe and then post honest and fair reviews about that recipe and how much they liked it, or not! In my case, I liked it! Thanks for listening to my remarks! Let’s emphasize the need to stop home chefs from posting their great recipes but leaving out such important details, such as Kosher salt, or Dijon mustard, or red potatoes! Thanks Dan!! They are some of our favorites so I’m glad you’ve had great luck with them also! 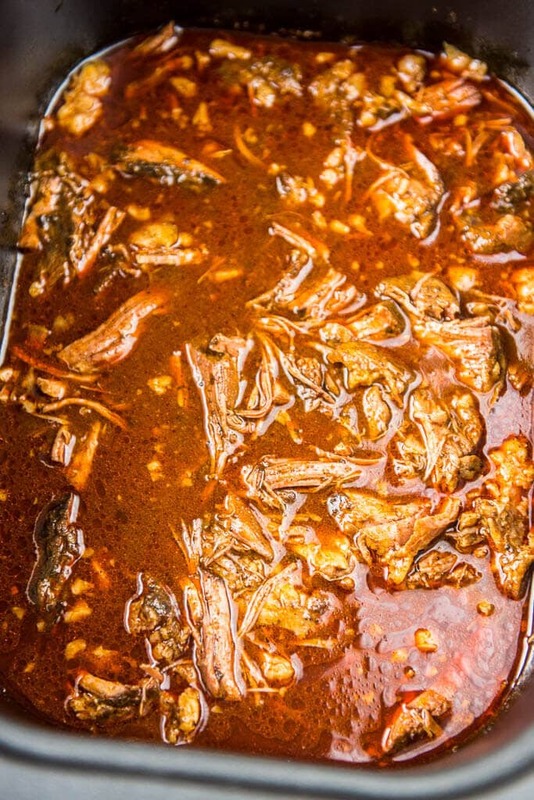 Could you cook the chili on high to reduce cooking time? 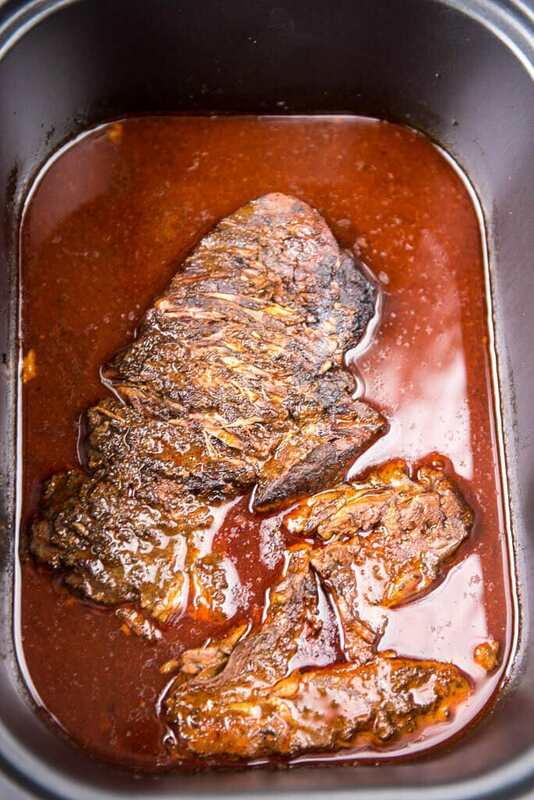 I haven’t tried this on high and probably wouldn’t recommend it since it uses a chuck roast which will be much more tender if cooked low and slow. It may work if you choose a more tender cut of meat? If you give it a try be sure to let me know! Awesome!! Love it 😉 Thanks!